The VW scandal and regulators’ failure to keep up with demand for green transportation. The VW scandal shows how the government fails green consumers. 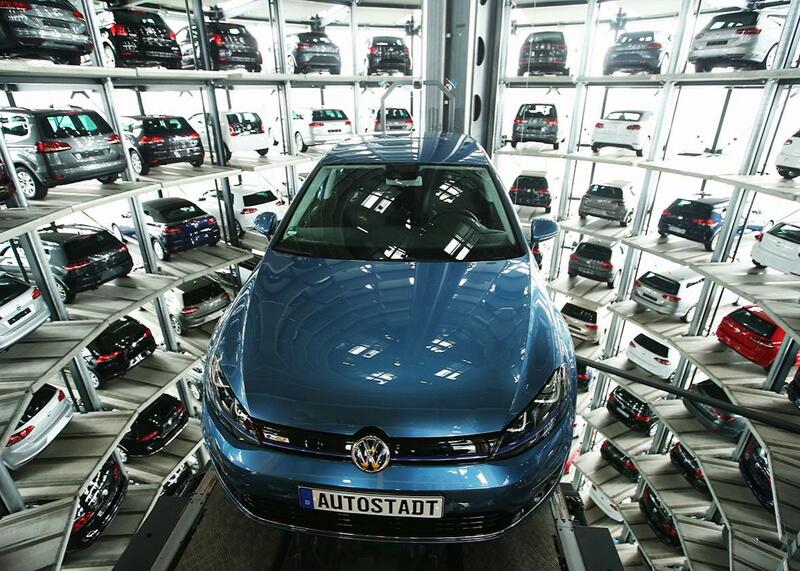 New passenger cars from Volkswagen await their new owners in one of the twin car towers at the Volkswagen factory in Wolfsburg, Germany, in April. But to the Volkswagen Group, which sold about 500,000 VW and Audi diesel cars between 2008 and 2015, green meant money. In 2015, none other than the Green Police, in the guise of the EPA, caught up with VW because its cars were spewing 10 to 40 times the legal amount of nitrous oxide, a potent pollutant that causes smog. (The range takes into account variations between models and driving conditions.) VW recently agreed to fix or buy back the vehicles, pay fines, and invest in “green vehicle technology.” Eventually we’ll know whether it’s on the hook for $10 billion, $18 billion, or more. The VW scandal is the result of a cult of cheating among some car manufacturers, an underfunded U.S. enforcement system, and the increasing power and meaninglessness of the word green. There’s no question that VW’s actions were criminal, but simply letting the justice system deal with the problem is missing the bigger issue: If we’re going reduce carbon and pollution emissions from transportation, we consumers need to face the fact that “green” transportation is meaningless unless it’s a compostable bicycle or a horse in a diaper. The VW scandal reveals how little power consumers have in the current system—and why we need to take it back. The story of the VW cheating scandal is one of two separate cons—one on the government and the other on consumers. Diesel fuel is energy-dense, so diesel vehicles get more miles to the gallon than gasoline. However, burning diesel releases nitrous oxides and particulates that have been implicated in asthma. In 2004, Audi was selling cars using an expensive catalyst and urea-injection process to reduce pollution, but the product, called Bluetec, added thousands of dollars to the cost and maintenance of the cars. In 2006, VW engineers and executives viewed a PowerPoint about using software to trick emissions tests while allowing pollutants to flow from diesel cars’ tailpipes during normal driving. Since 2009, this con has resulted in the emission of an estimated 13,000 to 59,000 extra tons of nitrous oxides in the U.S. alone. The second con, as the Green Police ad suggests, was on a particularly anxious strain of green consumer—the well-off early adopter who wants to be above reproach (while still having a lot of torque). VW played these buyers cynically. The cars’ reputation for passing “stringent emissions tests” and being fun to drive won them a bunch of “Green Car” awards. By 2014, VW was even lobbying the government to give buyers of these diesel cars rewards usually reserved for cutting-edge electric vehicles: tax rebates and access to high-occupancy vehicle lanes. CAFE standards initially aimed to double the fuel economy of passenger cars to 27.5 mpg within 10 years. When Jimmy Carter tried to extend them to pickup trucks and past 1985, he got shot down. Over the decades, the targets generally rolled back under Republicans and forward under Democrats. And in 2011, the Obama administration set the target at nearly 55 miles per gallon by 2025. Over time, testing and standards became a kind of proxy for environmental friendliness because they worked to reduce fuel consumption. By 1985, the U.S. fleet got twice as many miles to the gallon as 1975, and by 2002, the standards were saving 2.7 million barrels of gasoline a day. Between 2003 and 2014, CAFE standards played a significant role in reducing U.S. gas consumption, which was a surprising 6 million barrels a day less than the U.S. Energy Information Administration projected Americans would use over that period. Shrinking oil consumption brings environmental bonuses—lowering carbon dioxide and pollution emissions, and reducing the odds of oil spills. It also saves Americans billions of dollars that would otherwise be spent on fuel. CAFE standards drive economists crazy because they’re not as economically efficient as a carbon tax, but on the whole, when standards are high, they’ve accomplished their industrial goals. However, outside the aggregate, there’s always been tension between the letter of the law and the spirit of the law. The EPA testing regimen—which supplies data for tailpipe emissions, the Department of Transportation’s CAFE standards, the Department of Energy’s fuel economy listings, and the IRS’s gas-guzzler tax—has been vulnerable to cheating since the beginning. In July 1973 , the EPA found that VW had installed devices to trick emissions tests on its Beetles. GM’s Cadillac was busted in 1995. Since then, a host of companies have gotten caught: Honda, Ford, Hyundai, Kia, and lately Mitsubishi, Daimler, and Peugeot. That may well be the endpoint, but in the middle here, what is a confused consumer to do? The short answer is that no car is green—all cars carry environmental costs, some steeper than others. But consumers don’t have all the data to understand what those costs are. The current system of testing and standards, caught up as it is in a political struggle between competing interests, prioritizes test performance over what consumers want, which is cars that run cleaner in the real world. Consumers need to take back the concept of green, if not the word. We need more sophisticated metrics than the EPA’s numbers, but without them we’re dependent on marketing. We need transparency—perhaps an open-source version of data gatherers like OnStar and Verizon Hum that can ground truth claims about the vehicles. If we let manufacturers and the government proceed alone—as we have with fuel economy—consumers will have little control over how these new cars develop. And car designs are changing fast: Cars are probably going to be driving themselves soon—making tradeoffs that consumers need to see and judge. As we rely more on vehicle navigation systems, how should they prioritize routes—by time traveled or by emissions avoided? Ironically, that terrible Audi “Green Police” ad was right about something: Consumers are victims in the current system—terrified of getting punished for doing something wrong, but with nowhere to turn for information.